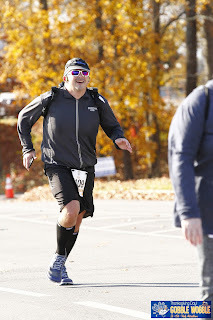 I was going to be back in Georgia for the Thanksgiving weekend and decided I wanted to run a half marathon on Thanksgiving as part of my training for my January marathon. 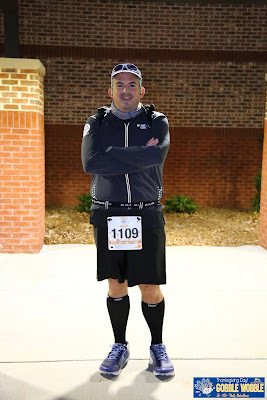 I chose this race based on running races in the past put on by North GA Running Co. The race is low key with decent swag. Runners of all distances receive a hooded long sleeve tech tee and a medal. There were water stations every couple of miles, but no gels and no sports drink of any kind. Luckily, I packed my trusty Orange Mud Double Barrel pack with 2 bottles of Nuun and carried gels on me to take every 30 minutes. Just after mile 7, the course returns to the long slow hill on Peachtree Parkway. My pace slowed further, but I would not let that deter me. From there on, I decided not to look at my watch. I would run as hard as I could, and hope I could keep up a pace that would still at least net me a PR.